Where is La Mischief Now? The motor up to Alanya was pretty easy. Both the swell and wind had died down to nothing much at all. It was a good opportunity to get Hugh acquainted with La Mischief before our sea crossing to Cyprus. Hugh picked it up quite quickly, putting his past sailing experience to good use. We hugged the coast and made it to Alanya about 2pm. We decided to bypass the Marina, which is 3km out of town and head for the town harbour as that seemed much more accessible. 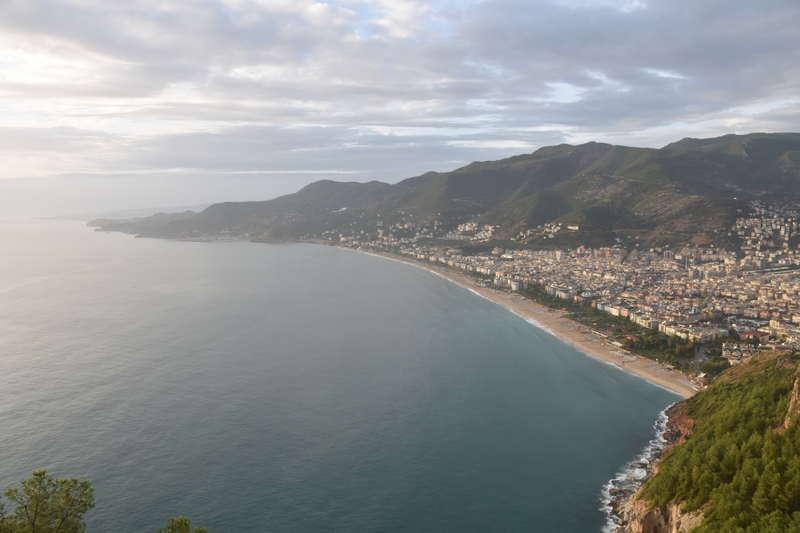 The approach to Alanya was spectacular, with a couple of castles and some extensive walls perched high above on the cliff’s edge. Further around we passed the Ottoman Shipyards and the Red Tower as we motored into the old harbour. The harbour itself was quite big but quite full. We motored around looking for a spot and found a couple of harbour master staff who told us to go stern to near a work boat. Safely berthed, we asked about getting an agent to help check us out of Turkey. A phonecall was made and all of a sudden it appeared we had a problem. It seemed his boss didn’t want us to stay in the old harbour and we should have gone to the marina as the harbour was only for commercial boats. Not to worry, if we paid him some cash, we could stay until 7am the next morning (ie. Before his boss got in!). The amount in cash started off at 50 euro and ended up at 30TL. 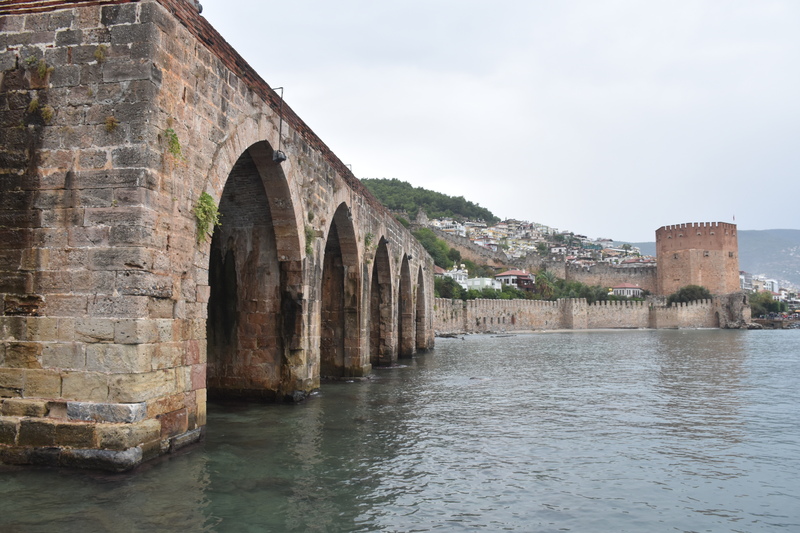 I gave him 40TL so he saw it as a bit of a win – besides it was cheaper than the taxi ride from the marina to town, and off we went to explore Alanya. 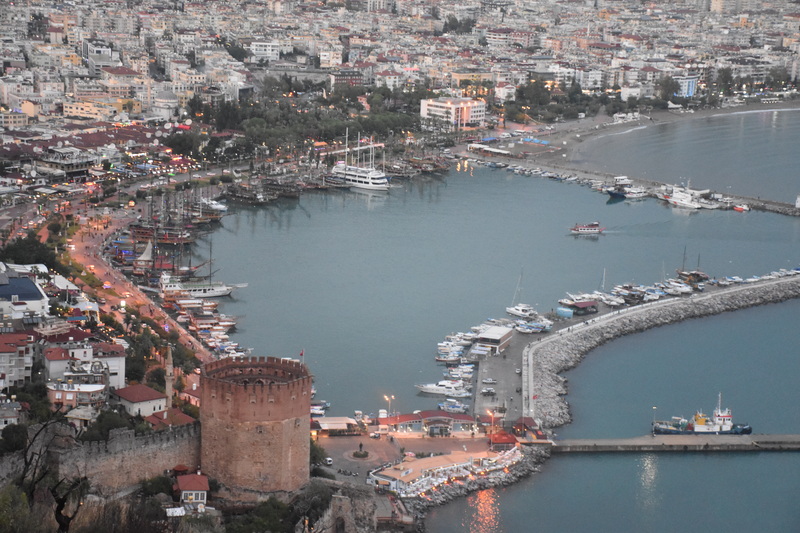 We started at the very impressive Ottoman boatyards, which were right around the corner from the harbour, and then climbed up the cliffs to see the two castles, and the magnificent views down to Cleopatra Beach to the marina in the distance. Unfortunately by the time we got back down to the Red Fort it was closed. We could have done with more than an afternoon to check out Alanya but we needed to get going to Cyprus. The good news was that the Rugby semi-final was about to start between Australia and Argentina. We wandered around the town and eventually found a bar where it was playing – in Dutch on some Euro sports channel. We’d watched the previous semi in Side with German commentary so we’d gotten used to it. Next morning, fresh from Australia’s big win, we pulled anchor and headed off to the marina, where we needed to go to check out of Turkey. Bad news was that we needed to pay for a whole day even though we only stayed a couple of hours. And we had to drive back into town with the agent to the authorities who were – you guessed it – located at the old port. Oh well. With our paperwork done and the necessary euros handed over; it was noon as we set off towards Paphos in Southern Cyprus, 110nm away. This entry was posted in Turkey and tagged alanya by stull61. Bookmark the permalink.